In a few weeks, people around the world will be celebrating their love. That’s right – Valentine’s Day is around the corner. A romantic couple’s getaway is always a great way to reignite love’s spark…far better than chocolates and teddy bears. With the variety of incredible lodges, spas, guest houses, hotels, and such across our incredible country, you won’t have to look very far to find the perfect spot. Here are a few dreamy destinations to get you inspired (Travel Ground; 2013). 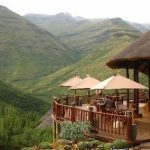 A jewel in the Lesotho highlands, Maliba Lodge is perched overlooking all that makes the area a pristine mountain retreat the likes of which would expect to only find in a fairy tale! 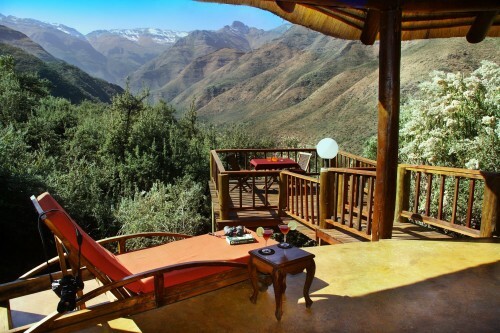 Your private and luxurious Basotho-style 5 Star chalet, complete with a sunken bath and fire place, will create an idyllic home away from home while you and your partner immerse yourselves in this breath-taking sanctuary. Your private viewing deck, extending from your chalet, allows you a completely unique way to touch the heart of the Lesotho Mountains, losing yourself in the charm of the peaceful surroundings. The gourmet meals, excellently prepared, are sure to delight you and with attentive staff ensuring you are well taken care of, the only challenge you will face in this romantic wonderland will be having to leave! Hitgeheim Country Lodge lies on an eco-reserve, only minutes from the Addo Elephant National Park, and exudes an atmosphere of romance and relaxation. Awake to the evocative cries of the fish-eagles, experience an exhilarating elephant back safari, and enjoy the most breath-taking sunsets as the day gives in to the silence of the African night (Travel Ground; 2013). The luxurious 5-star bush retreat has Luxury and Superior Chalets, 2 of which are honeymoon suites. Set amongst indigenous gardens with abundant birdlife, the stylishly appointed en-suite bedrooms have private wooden decks with panoramic views of the Sunday’s River Valley below. Hitgeheim Country Lodge has a reputation for outstanding cuisine and a brilliant wine selection that will perfectly complement your gourmet candlelight dinner (Travel Ground; 2013). Franschhoek Country House & Villas is a restored manor house surrounded by enchanting vineyards and majestic mountains. Only an hour’s drive from Cape Town, the hotel offers 5-star luxury rooms and villa suites with all the features that can be expected from a first class hotel (Travel Ground; 2013). Warm summer days are ideal for lazing alongside the two pools (one is heated), picnics under the oak trees, leisurely saunters through the charming town, and visits to the boutique wine estates in the Franschhoek valley. Voted one of South Africa’s top restaurants, the on-site Monneaux restaurant is famous for its innovative modern French cuisine. Enjoy a la carte lunches on the magnificent fountain terrace and dinners served in the elegant dining room or enclosed veranda. Toast your loved one with local wines that can be enjoyed in the cosy wine bar or underground cellar. Complete your experience with a pampering spa massage or facial in the treatment room (Travel Ground; 2013). Situated in the Sterkfontein Nature Reserve, at the foothills of the Northern Drakensberg Escarpment, Wild Horses Lodge boasts panoramic views of the majestic Platberg Mountain and the vast Sterkfontein Dam. 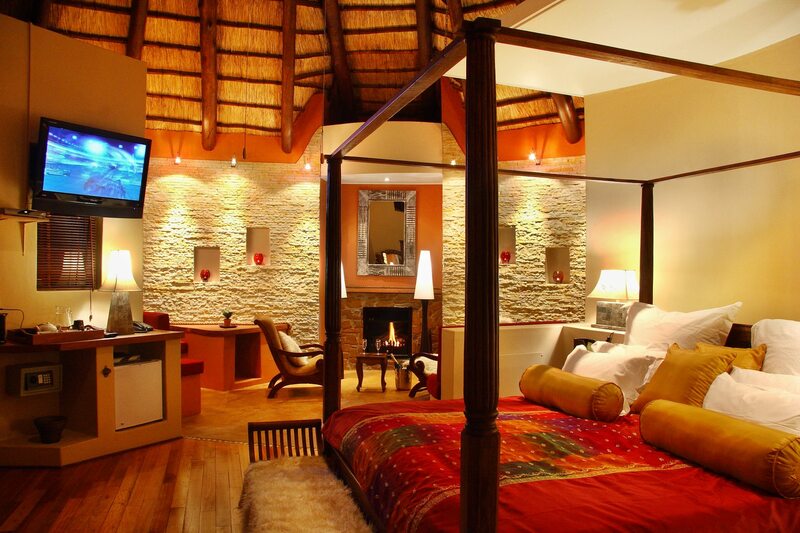 Enjoy luxury accommodation, tantalising cuisine, a variety of activities centred around the dam, and abundant wildlife on the mountainous reserve (Travel Ground; 2013). This small, romantic country lodge offers warm and personalised service. With only four luxury rooms (and no children or pets allowed) you can enjoy the ultimate in tranquillity, comfort, and sophistication. The lodge features a dining room that leads onto a widespread terrace, a lounge with private library, and a well-stocked wine cellar. A Koi pond, rim-flow pool, rose garden, and landscaped indigenous garden complete the serene picture (Travel Ground; 2013). Mongena Game Lodge is a 4-star safari lodge in the malaria-free region of Rust De Winter, only a 30 minute drive from Pretoria. The lodge is situated on the Dinokeng Game Reserve, home to the Big Five as well as zebra, hippo, crocodile, giraffe, warthog, all species of antelope, and an abundance of birdlife. With resident Nyala herds roaming the gardens, the gourmet Kingfisher Restaurant, and a quaint chapel, you can enjoy an unrivalled safari experience in the distinct African bush (Travel Ground; 2013). Mongena Game Lodge has a variety of tastefully furnished chalets, including a dreamy honeymoon suite, positioned along rolling lawns and indigenous landscaping. Complete your Valentine’s experience with a hot air balloon ride or sunset cruise on the Pienaars and Boukenhout rivers (Travel Ground; 2013).